Food is a central force that brings families and communities together. Delicious and nutritious meals are also a healthy avenue to refuel for our adventures. At Go RVing Canada, we believe passionately that this is especially true when out with friends and family on a camping journey. We also know how tough it can be to provide these types of meals whilst camping or just simply enjoying the great outdoors in between treks. Even more overwhelming if facilitating for larger families or groups, or younger, potentially picky eaters. Below is a round up of 6 “Fuss-Free” meal ideas for the modern camper so that you can focus on what’s most important… more time enjoying the food and each other’s company, rather than prepping, cooking, and clean up. The true nature of camping or RVing is being outdoors and getting in tune with nature. One of the best ways to do so is hiking and backpacking. Regardless if you have young’ins or not, this source has some great pre-planned on-the-go bagged mixes of different trail mixes, oat meals, and even just delicious dinners that you have to add hot water to. Our favourite is the cheap but nutritious oatmeals and fruits for hearty snacks on the go, or in the RV or vehicle on the road. Simple prep and even easier eating. Enjoy! Tin Foil is one of the cheapest materials and cooking tools all in one. When camping, it is always good to be prepared. Sometimes, we leave the odd utensil at home that could ruin your options. Damn Delicious has 8 quick and easy foil recipes to choose from. Most involve potatoes or a protein of sorts. Our favourite recommendation would be the lemon chicken and potatoes which lands at #4 on the list. Two minutes of prep time, and only five minutes to make without any need for baking! These tasty treats are easy enough for the not-so-big-on-cooking type in the family. Anyone can pitch in on the meal process, and who doesn’t love dessert! Peanut butter and chocolate is always a great pairing. Why wait until the local fair to have those delicious cinnamon mini donuts we all know and love. This really simple recipe allows the family to have some fun over the campfire. We highly encourage for the kids to have some fun with their dough shapes, however the common hole in the middle technique will produce a more thoroughly cooked donut. Finish with cinnamon and other tasty dressings if you want to experiment. Everyone loves pizza, we think that’s a given, so why not take it to the great outdoors! Plus most RVs and campers nowadays, including older models, will have a stove top burner either inside or outside their unit. This recipe is geared towards a family-centric activity, so have fun with it! We highly encourage experimenting with different toppings and flavours and would love to hear any variations you take on. Bon Appétit. Martha Stewart is a mastermind in the kitchen and she has some great recipes to share with the Outdoorsy world. This selection of different campfire cooking options for breakfast, centred around eggs, will have your kids begging for more! We love the idea that food is meant to shared. Why?! These types of foods spark conversation much more so than eating separately. Reaching in for the same hearty nacho handful at the same time is a quick way to encourage a good ol’ Canadian “sorry, go ahead” or just a good laugh. 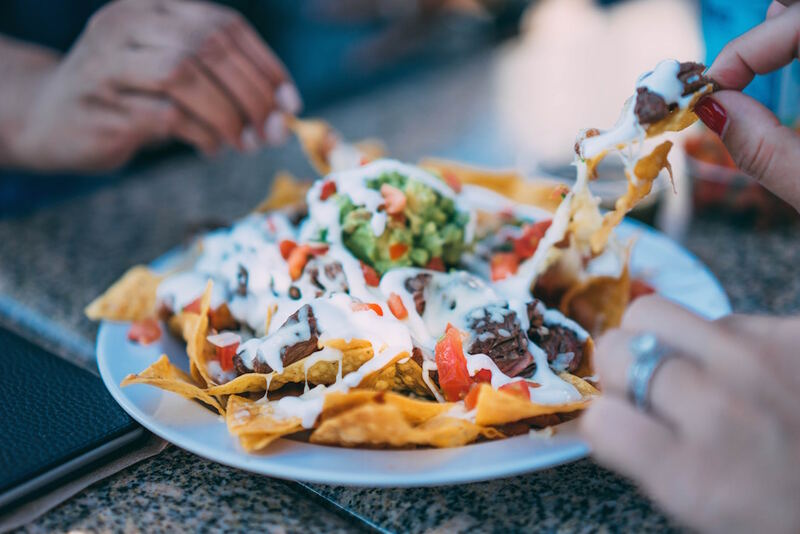 Nachos are a staple at every bar and restaurant and, old or young, we all love ‘em. All the food ideas laid out above are at risk of nasty bugs and unwanted insects invading your dishes. This recipe for your own DIY citronella bowl is a fun way to be crafty with the kids, but more importantly, to protect your fuss-free dishes from unfriendly guests. You don’t have to break the bank buying the citronella candles. Please feel free to reach out to us after trying these delicious options. We would love to hear your feedback from your experience whipping these up. As well, we would love to hear some of your go-to recipes that are easy to craft up for the fellow camper.